A 70-year-old male with a recent diagnosis of aortoiliac disease was referred to our department for elective coronary artery bypass surgery (CABG). 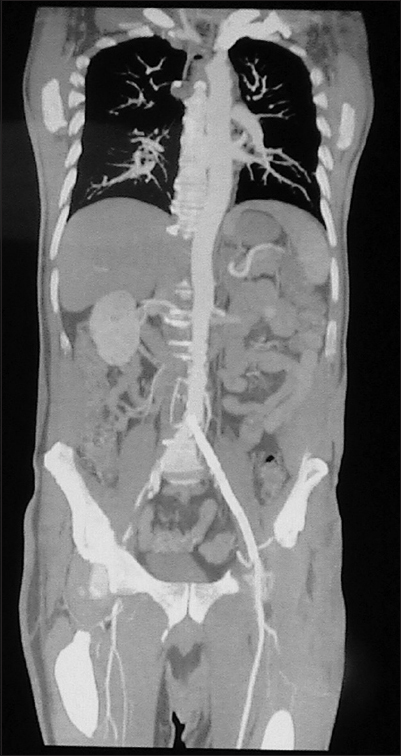 His computed tomography angiography (CTA) revealed proximal left common iliac artery and proximal right external iliac artery obstruction. In addition, the following collateral pathways were demonstrated: From right subclavian and internal thoracic arteries to right external iliac artery through epigastric arteries and also a greater one at the left side between left internal thoracic artery, which was exceptionally large vessel to left external iliac artery through epigastric arteries, providing total perfusion of the left lower extremity [Figure 1]. Interruption of this collateral flow would cause severe leg ischemia. Endovascular treatment of aortoiliac disease was the first intervention that was decided. Percutaneous endovascular procedure (percutaneous transluminal angioplasty stent) was successfully performed in the left common iliac artery but failed in the right. A month later, a repeated CTA evaluation revealed left iliac artery-femoral axis patency and decreased appearance of left-sided anterior collateral pathway [Figure 2]. Then, he underwent CABG procedure with the use of left internal thoracic artery (ITA) as a conduit to the left anterior descending artery. He had an uneventful postoperative period. 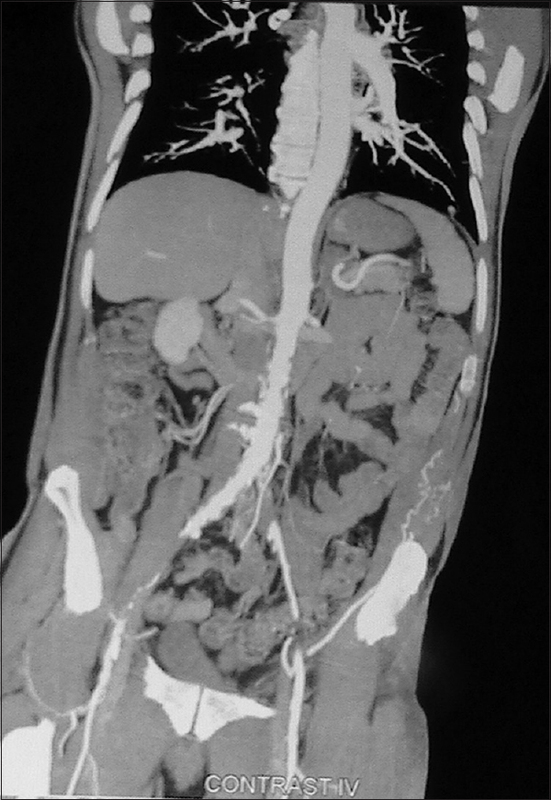 He was scheduled for open vascular surgery for the right external iliac artery obstruction. ITA is an excellent conduit for coronary artery bypass. In chronic aortoiliac disease, the development of anastomotic pathways, such as Winslow's collateral, may provide perfusion to the lower extremities. If this is not diagnosed, the use of ITA as a bypass graft may cause lower limb ischemia. Incidence of Winslow's pathway is not well documented. Based on angiographic reports, Winslow's flow is common in cases with severe arterial obstruction (stenosis of >75%). A more detailed imaging investigation could be suggested in severe cases of aortoiliac disease before the decision for ITA use. Bobylev D, Fleissner F, Zhang R, Haverich A, Ismail I. Arterial myocardial revascularization with right internal thoracic artery and epigastric artery in a patient with Leriche's syndrome. J Cardiothorac Surg 2013;8:53. Yapici F, Tuygun AG, Tarhan IA, Yilmaz M, Tuygun AK, Yapici N, et al. Limb ischemia due to use of internal thoracic artery in coronary bypass. Asian Cardiovasc Thorac Ann 2002;10:254-5. Kim J, Won JY, Park SI, Lee DY. Internal thoracic artery collateral to the external iliac artery in chronic aortoiliac occlusive disease. Korean J Radiol 2003;4:179-83.